The 5th Annual V8TV Drive In Cruise kicks off on Thursday, August 15, 2019 at 6:00 PM at the Sky View Drive In in Belleville, IL! VOTE for the film we show this year on our Facebook page! TICKETS go on sale January 31, 2019 at 10:00 AM Central. It's hard to believe this Foose Design 1957 Chevy Bel Air convertible was in pieces just a few days before the custom blue show stopper was shown to the public for the first time at the 2018 SEMA Reveal. Riding on a Roadster Shop chassis, it is powered by a GM LS3 V8 and features custom billet wheels with nostalgic flair but retains the timeless look of the iconic 1957 Chevy Bel Air. The 2018 SEMA Reveal was hosted by V8TV's Kevin Oeste the night before the 2018 SEMA Show opened in Las Vegas. Join us at the 2018 Muscle Car and Corvette Nationals in Rosemont, IL on November 17 and 18! Presented by MECUM Auction Company, Show Your Auto.com, and OPGI. And now, you can tune in to the V8TV MCACN After Hours Live! streaming video show on Facebook and YouTube! We'll be sharing features of some of the coolest cars at the show, interviewing owners, show organizers, and sponsors, artists, and much more. Watch the 2018 SEMA Reveal Live from V8TV! V8TV's LIVE COVERAGE of the 2018 SEMA REVEAL! V8TV goes live on Monday, October 29th at 5:00 PM Pacific from the 2018 SEMA Show in Las Vegas! We’ll reveal some of the top cars of the 2018 SEMA show a day before the SEMA Show doors open! It’s truly a sneak preview of what’s in store for this year’s biggest industry-only show, and you get a front-row seat with this exclusive V8TV live coverage! Look for new cars from Chip Foose, Dave Kindig, and other big names including top-secret projects from new car manufacturers crossing the red carpet ramp and stopping for an interview with V8TV's Kevin Oeste. As each car leaves the stage, we’ll be cutting to other SEMA feature cars throughout the night, including some of the 2018 Battle Of The Builders competitors. We’re also previewing some brand new V8TV videos! We’ll return to the live stage as the next new ride approaches, so you won’t miss a single reveal on the SEMA Red Carpet Stage. Stay tuned to see them all, and be sure to share the V8TV Facebook Live or YouTube stream with your friends! We welcome viewers on Edge TV and OPGI’s Facebook pages as well. V8TV’s Live Coverage of the 2018 SEMA Reveal is brought to you in part by Original Parts Group, Premium Quality GM Restoration and Performance Parts Since 1982! And by the Mecum Auction Company, the world’s largest collector-car auction house. Visit http://www.mecum.com today to start your own Mecum Experience as a buyer, seller or spectator. The Experience begins at Mecum.com. CLICK THE SUBSCRIBE BUTTONS BELOW SO YOU DO NOT MISS THE V8TV'S COVERAGE OF THE SEMA REVEAL LIVE! V8TV PRESENTS SEMA REVEAL LIVE! is an all-new video streaming experience sharing the best cars and stories of the SEMA show with car fanatics over the world. The SEMA event is just as much about the people and the stories as it is the cars. V8TV PRESENTS SEMA REVEAL LIVE! will cover the Monday Night SEMA Reveal event to share some of the hottest cars of the 2018 SEMA Show, and to meet the personalities who make it all happen, in an exciting, LIVE experience! 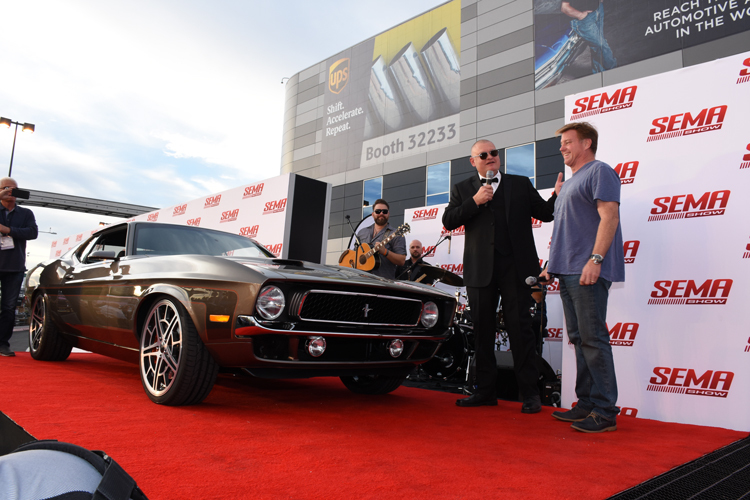 Now in it’s second year, The SEMA REVEAL is a hugely popular press event where host Kevin Oeste welcomes some the highest profile cars from top builders into the SEMA Show on a red-carpet stage. In 2017, Builders like Chip Foose, Dave Kindig, Kyle Tucker, Ryan Friedlinghaus, Mark Worman, and many more drove their latest SEMA builds up the ramp as James Otto provided the soundtrack. Once in the spotlight, Oeste conducted a 3-4 minute interview with each builder to share the car and parts used with the live audience. As the car leaves the stage, more music plays as it enters the biggest automotive enthusiast event on the plant. This year, V8TV PRESENTS SEMA REVEAL LIVE! aims to share that magical experience with enthusiasts all over the world, with exclusive LIVE STREAMING multi-camera coverage of the event. Hosted by Kevin Oeste (Muscle Car Of The Week, V8TV, SEMA, SEMA) we’ll show the cars, share the stories, and chat with the people who make it all happen, and we’re doing it live, streaming on various site and pages for the world to watch and share. V8TV coverage of the SEMA REVEAL LIVE! goes live Monday night, October 29 around 5:00 PM and continues to stream throughout the night, presenting cars and breaking news items from the world’s largest automakers. Best of all, V8TV PRESENTS SEMA REVEAL LIVE! is easy to share via sponsor and enthusiast social media outlets, and will no doubt be shared by enthusiasts all over the world. The potential audience is enormous, and the video will be archived, shareable, and viewable forever. There is no show like SEMA, and there’s never been coverage like V8TV PRESENTS SEMA REVEAL LIVE!! Tune in to the V8TV YouTube channel, Facebook page, or V8TVshow.com website to see the live coverage on Monday, October 29 at 5:00 PM PST! V8TV Productions, Inc., is excited to be working with the Performance Racing Industry trade organization (PRI) to host a live stage at the 2018 PRI Show in Indianapolis, IN, December 6-8. The stage will be buzzing with activities all day each day of the PRI Show, with attractions ranging from press conferences and interviews to seminars and full-blown roundtable discussions. The V8TV crew will be using content from the stage for online and V8TV television episodes, and PRI will also be sharing relevant content in their newsletters, social, and websites. >>>CONTACT US FOR MORE INFORMATION ABOUT THE PRI / V8TV STAGE - CLICK HERE! Highlights will be a series of round table presentations, with 7 events planned. These are approximately 1 hour in length. Moderated by automotive host Kevin Oeste, (SEMA, V8TV, Muscle Car Of The Week, Muscle Car and Corvette Nationals), these live shows bring racing personalities to the stage as well as manufacturers and engine builders to discuss some of the hottest racing topics. A description of each is below. In addition, there will be at least 6 individual ½ hour seminars as well, with additional hot topics in a shorter format. The remaining stage time will be dedicated to press conferences, new product reveals, PRI-scheduled interviews, daily recaps from the show, and more. These roundtable presentations offer not only a live stage experience, but will live on through social media, web streaming, television content, and in selected PRI communications. We are offering several sponsorship levels to integrate your company’s presence in these exciting presentations. ...and more as they develop. In addition, for shorter form product releases and press announcements, the V8TV Stage will be available for 15 minute presentations. We’re all extremely excited to work with PRI to host the V8TV Roundtables, Seminars, and Interviews during the best racing show in the country, and we’re equally excited to share the content around the racing world. We hope you can join us! CLICK THE SUBSCRIBE BUTTONS BELOW TO SEE MCACN AFTER HOURS LIVE! (Rosemont, IL) September 26, 2018… MCACN AFTER HOURS LIVE! is the all-new OFFICIAL streaming video experience sharing the best cars and stories of the 10th Annual Muscle Car And Corvette Nationals (MCACN) show with Muscle Car fans all over the world! The MCACN event is perhaps the top Muscle Car show in the world, and is just as much about the people and the stories as it is the stunning array of pinnacle cars. A special presentation of Muscle Car TV sh ow V8TV, MCACN AFTER HOURS LIVE! streams on the V8TV Facebook (https://www.facebook.com/V8TVshow/) and YouTube channel (https://www.youtube.com/user/V8TV) Saturday night, November 17 at 8:00 PM CST, right from the MCACN show floor. Facebook streams will be cross-posted on the MCACN page (MCACN/), Muscle Car Of The Week Facebook page (https://www.facebook.com/MuscleCarOfTheWeek/), various sponsor pages, and by viewers. V8TV has gained overnight access to the show in a lights-on, uncovered, closed-door setting that is nothing short of surreal. Hosted by Kevin Oeste (Muscle Car Of The Week, V8TV, SEMA, MCACN,) MCACN AFTER HOURS LIVE! aims to share that magical experience with enthusiasts all over the world, delivering a virtual “private tour” of the 10th annual event. Attending MCACN? Click the button to apply to be a guest on MCACN After Hours Live! The potential audience is enormous, and the whole MCACN AFTER HOURS LIVE! show will be archived, shareable, and viewable forever. There is no show like MCACN, and there’s never been coverage like MCACN AFTER HOURS LIVE! The Muscle Car and Corvette Nationals is the world’s largest all indoor specialty show devoted to Muscle Cars, Dealer-built Supercars and the finest Corvettes. We will fill nearly 400,000 square feet of the beautiful Donald E. Stephens Convention Center in Rosemont, (suburban Chicago) just minutes from Chicago’s O’Hare Airport. The show takes place annually the weekend before Thanksgiving, which is Saturday, November 17, and Sunday, November 18 this year. See over 550 of the best of the best and the rarest of the rare, many from private collections that are rarely if ever shown, all under one roof. MCACN.com. HELP PRESENT THE MUSCLE CAR AND CORVETTE NATIONALS AFTER HOURS LIVE! STREAMING VIDEO SHOW! MCACN AFTER HOURS LIVE is an all-new video streaming experience sharing the best cars and stories of the MCACN show with Muscle Car fans all over the world. The MCACN event is just as much about the people and the stories as it is the cars. MCACN AFTER HOURS LIVE will provide a personalized, front-row experience through streaming media to share the sights and stories of the show, and to meet the personalities who make it all happen, in an exciting, LIVE experience! The MCACN show embraces the media and allows credentialed members of the media overnight access to the show. To be surrounded by some of the best Muscle Cars on the planet in a lights-on, uncovered, closed-door setting is nothing short of surreal. MCACN AFTER HOURS LIVE aims to share that magical experience with enthusiasts all over the world, delivering a virtual “private tour” of the show. Hosted by Kevin Oeste (Muscle Car Of The Week, V8TV, SEMA, MCACN) we’ll show the cars, share the stories, and chat with the people who make it all happen, and we’re doing it live, streaming on various site and pages for the world to watch and share. MCACN AFTER HOURS goes live after the doors close to the public on Saturday Night, November 17 around 8:00 PM, and continues to stream throughout the night. We’ll be live into the wee hours, stopping the broadcast only when the last story is shared. Best of all, MCACN AFTER HOURS LIVE is easy to share via sponsor and enthusiast social media outlets, and will no doubt be shared by enthusiasts all over the world. The potential audience is enormous, and the video will be archived, shareable, and viewable forever. There is no show like MCACN, and there’s never been coverage like MCACN AFTER HOURS LIVE! Your company can be part of the show through one of the sponsorship opportunities listed below. Help us produce the first MCACN AFTER HOURS LIVE event and share this amazing show with the world! 8:00 PM Saturday, November 17, 2018, until ?? MCACN AFTER HOURS LIVE! Is hosted by veteran Muscle Car TV personality Kevin Oeste. Oeste has been an integral member of the MCACN show media coverage for years, not only providing video and TV coverage of the event via the V8TV and Muscle Car Of The Week TV and web shows, but also as an Emcee and Host at the event. Oeste is also the host of the SEMA Reveal, SEMA Central Stage, and SEMA Cruise at the SEMA show in Las Vegas, as well as the President of the V8 Speed & Resto Shop and V8TV Productions, inc.
Oeste will be joined by pre-scheduled and impromptu guests attending the 2018 MCACN show, ranging from participants displaying cars to event sponsors and MCACN organizers. There is no show like MCACN, and there’s never been coverage like MCACN AFTER HOURS LIVE! MCACN AFTER HOURS LIVE! Is a true live late-night show, unscripted, with live guests, feature cars, show sponsors, and more. MCACN AFTER HOURS LIVE! Will be streamed on the V8TV Facebook page and V8TV YouTube Channels, shared on the MCACN show pages, and all the sponsor pages of the MCACN show sponsors, and streamed on V8TVshow.com and Muscle Car Of The Week.com Facebook pages and websites. We will be adding additional sharing partners as we get closer to the event. The entire broadcast will be saved for on-demand viewing by those who missed or wish to relive the live show, and will live on YouTube, Facebook, V8TVShow.com, MuscleCarOfTheWeek.com, and the MCACN website for future viewing and sharing. Opportunity to co-host the live event! :30 commercial runs 4x during the live streaming event - we can produce if needed. Logo on all MCACN After Hours Live materials, promotions, apparel, etc. Share the live stream to your company’s FB page, to increase the reach. We can help. Simply fill out the form below to get started on your sponsorship!